Moloney & Associates Acoustic and Environmental Consultants have been involved with testing the performance of walls and floors since 2004 and have acquired significant experience in the construction sector. With have acted as expert witnesses for engineers, architects and construction companies and have provided expert testimony in court cases where alleged acoustic defects were claimed. We have also acquired experience in remedial treatments where building defects have been remedied to ensure compliance. ISO 16283-1:2014 specifies procedures to determine the airborne sound insulation between two rooms in a building using sound pressure measurements. 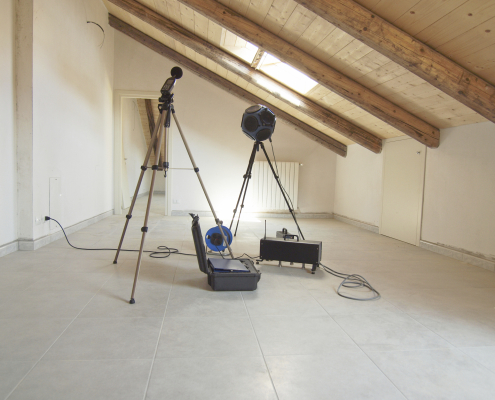 The test results can be used to quantify, assess and compare the airborne sound insulation in unfurnished or furnished rooms. The measured airborne sound insulation is frequency-dependent and can be converted into a single number quantity to characterize the acoustic performance using the rating procedures in ISO 717‑1. ISO 717-1:2013: a) defines single-number quantities for airborne sound insulation in buildings and of building elements such as walls, floors, doors, and windows; b) takes into consideration the different sound level spectra of various noise sources such as noise sources inside a building and traffic outside a building; c) gives rules for determining these quantities from the results of measurements carried out in one-third-octave or octave bands in accordance with ISO 10140-2, ISO 140-4, and ISO 140-5. The single-number quantities in accordance with ISO 717-1:2013 are intended for rating airborne sound insulation and for simplifying the formulation of acoustical requirements in building codes. An additional single-number evaluation in steps of 0,1 dB is indicated for the expression of uncertainty (except for spectrum adaptation terms). The required numerical values of the single-number quantities are specified according to varying needs. The single-number quantities are based on results of measurements in one-third-octave bands or octave bands. The current requirements relating to building acoustics in the domestic property sector are provided for in the Building Regulations 2014 – Technical Guidance Document – Part E Sound. One of the aims of Part E of the Second Schedule to the Building Regulations is to ensure that dwellings achieve reasonable levels of sound insulation from sound transmission emanating from adjoining buildings or differently occupied parts of the same building. 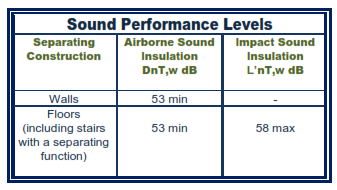 In general for dwellings, the performance required by the regulations should be satisfied by achieving the sound insulation performance levels as specified in Table 1.